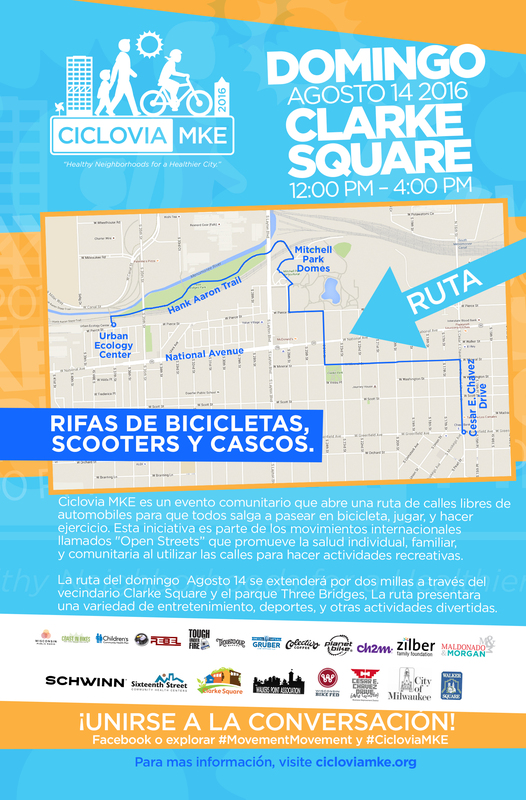 Ciclovia MKE is a free public event that opens a route of car-free streets to bike, play, and exercise. 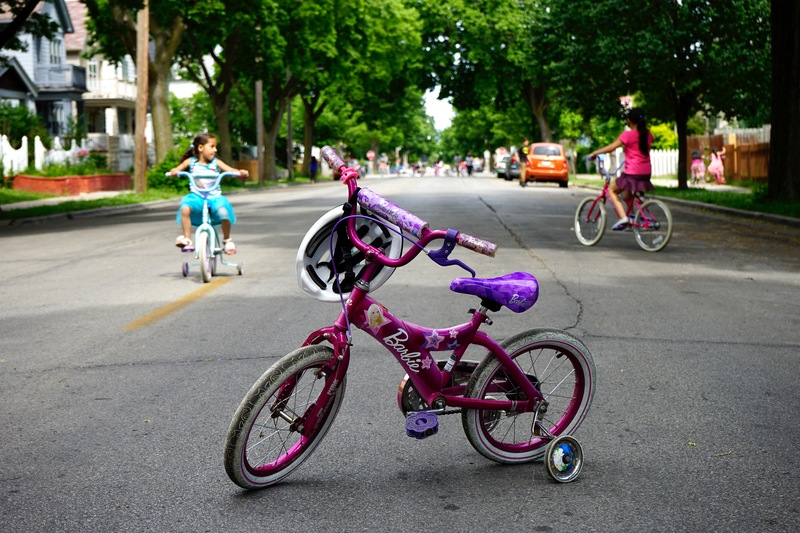 The initiative is part of an international effort of Open Streets movements that advocate for healthy lifestyles, families and communities by utilizing city streets for recreational activities. The route on August 14th will stretch about two miles through the Clarke Square neighborhood and Three Bridges Parks and will host a variety of entertainment, sports, and other activities. 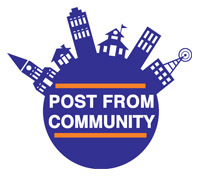 Share our Volunteer and/or Get a Spot pages so your friends and family can get involved in the fun! Are you ready to join the #MovementMovement? City streets will be car-free and open to bike, play, and exercise at #CicloviaMKE on August 14th, 2016! #CicloviaMKE returns on August 14th, 2016! 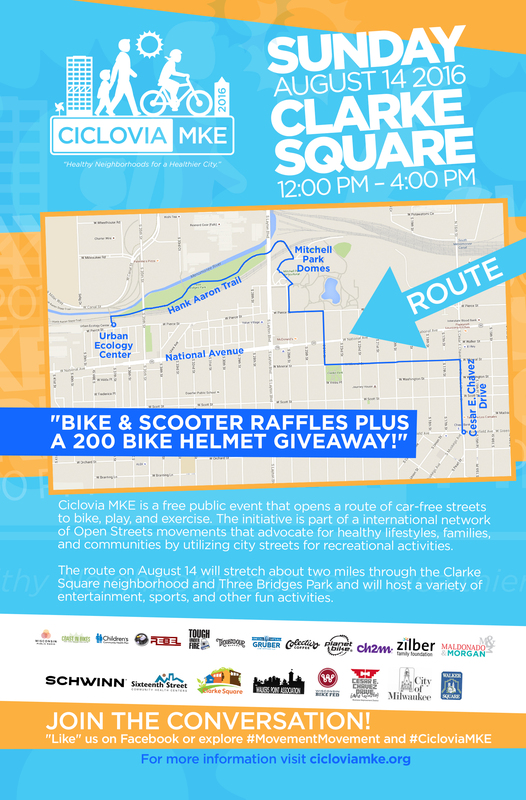 Head out to Clarke Square and Three Bridges park for two miles of open city streets featuring a bike + scooter raffle and a 200 bike helmet giveaway! Below are the event poster and route map, please share and help us spread the word about the #MovementMovement at #CicloviaMKE!